SpaceX's first Falcon 1 rocket on its Kwajalein Atoll launch pad before it was lost during ascent on March 24, 2006. Thisstory was updated at 7:22 p.m. EST. After yearsof development and no less than three scrubbed attempts, a solitaryFalcon 1 rocket roared toward space Friday only to be lost just after liftoff,its builders said. The privatelaunch firm Space Exploration Technologies (SpaceX) launched the two-stage Falcon1 rocket at 5:30 p.m. EST (2230 GMT) in a space shot staged from the U.S.military's Ronald Reagan Ballistic Missile Test Site at the KwajaleinAtoll in the Pacific Ocean's Marshall Islands. 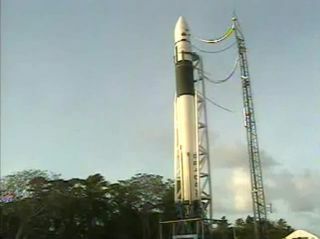 But momentsafter ignition, webcast video from the rocket appeared to show a rolling motionbefore the feed was lost. Details surrounding possible causes for the rocket'sfailure were not immediately available. "We had asuccessful liftoff and Falcon made it well clear of the launch pad, butunfortunately the vehicle was lost later in the first stage burn," SpaceXchief ElonMusk said in an update posted to his El Segundo, California-based firm'swebsite. "More information will be posted once we have had time to analyze theproblem." The ill-fatedlaunch marked SpaceX's fourth attempt to loft its inaugural Falcon 1 vehicle afterglitches preventedthree earlier efforts. SpaceX employees and launch controllers could be heardvia an audio link shouting "Go!" just after launch, only to fall silent oncethe failure was evident. "I did haveword that we did lose the vehicle," Gwynne Shotwell, SpaceX vice president of businessdevelopment, told reporters. "Clearly this is a setback, but we're in this forthe long haul." The rocketwas expected to deploy its cargo, the small, cube-shaped FalconSat-2satellite built by U.S. Air Force Academy, about 10 minutes after launch. The$800,000 satellite was designed to measure the effects of space plasma oncommunication and global positioning satellites. The mission carried a $6.7million price tag covered by the U.S. Air Force and the Defense AdvancedResearch Projects Agency (DARPA). "We were ofcourse very disappointed," U.S. Air Force Academy spokesperson John van Winkletold SPACE.com, adding that cadets packed the FalconSat-2 flight controlroom to capacity to watch the attempted launch. "We were so excited to see itfinally lift off." Earlierattempts to launch Falcon 1 and its FalconSat-2 payload were thwarted by liquidoxygen leaks, computer and structuralglitches, as well as unsatisfactorypad tests, SpaceX officials said, adding that at one point 4,500 peoplewere watching today's launch webcast. Musk, whoco-founded the Internet-based payment service PayPal, founded SpaceX in 2002. The 68-foot(21-meter) Falcon 1 rocket is the first in a family of boosters planned bySpaceX to offer a more affordable option to launch satellites, cargo andpossibly people into space. All Falcon 1 launches are costcapped at $6.7 million, Musk has said. Fueled by keroseneand liquid oxygen, the booster features a homegrown Merlin engine and areusable first stage, SpaceX officials hoped would parachute back to the ocean forlater recovery for use on future flight. SpaceXbuilt the Falcon 1 vehicle to carry payloads of up to 1,256 pounds (570 kilograms)into low Earth orbit (LEO) - FalconSat-2 was aimed at an orbit that ranged between279-310 miles (450-500 kilometers) - from launch pads at the Kwajalein Atolland California's Vandenberg Air Force Base. Beforetoday's launch failure, Shotwell said SpaceX hoped to launch its second Falcon1 rocket - to orbit the TacSat-1 built by the U.S.Naval Research Laboratory - in about five months, with a Malaysian payload andseveral secondary microsatellites to follow from the atoll in February 2007. Thosemissions will likely be delayed until SpaceX officials complete theirinvestigation and analysis of today's lost Falcon 1 booster. PotentialSpaceX customers were looking forward today's launch, especially since the U.S.Air Force has awarded SpaceX contract worth up to $100 million to launch satellites under itsDARPA/FALCON program. "If he is successful, and wecertainly hope he is, we are going to be a big customer of his," said U.S. AirForce Lt. Col. Daniel Griffith, the director of the Defense Department's SpaceTest Program, before today's launch. "We are rooting him on like crazy." Encouragementfor SpaceX was still strong amid spaceflight supporters after the Falcon 1loss. "Just lastmonth, Musk stated that the ultimate goal is to make life multi-planetary," saidNational Space Society president George Whitesides in a statement. "Elon isputting his money towards a grand vision - and if his bet pays off, all ofhumanity will win. It is a most worthy goal, and we are sure that theSpaceX team will learn from today and push forward." Prior totoday's launch attempt, Musk told SPACE.com that some of his Falcon 1rocket's growing pains could have been avoided by conducting pre-launch enginetest. "The singlebiggest lesson is that we should have planned to do a static fire,which is analogous to the engine run up done by aircraft, before the firstlaunch attempt," he said in an e-mail interview. "That would havehighlighted some of the issues we saw early on and might have allowed us tolaunch sooner." SpaceXengineers conducted severalengine static fire checks leading up today's launch attempt and all seemedgo for launch. Each of thescrubbed launch attempts could provide a wealth of data that allowed SpaceXlaunch controllers and engineers to hone their skills, Musk said earlier,adding that even if Falcon 1 didn't perform as planned, knowledge would begained. "I reallybelieve that constant improvement is the path to revolutionizing spaceexploration," Musk said before today's launch. WhileFalcon 1 is designed to launch smaller payloads into LEO, plans for the firm's largerFalcon 9 boosterare slated to allow payloads of up to 21,000 pounds (9,500 kilograms) in amedium configuration and 55,000 pounds (25,000 kilograms) cargo to LEO in itsheavy configuration. It is theFalcon 9 that SpaceX hopes to use for its Dragon spacecapsule, a reusable craft it is developing to compete for NASA flights tosupply and crew the International Space Station (ISS). Musk has said that humanspaceflight has always been his target for SpaceX. "We need aMoore's Law of space, similar to that of the semiconductor arena, wherethe cost per pound cost of access to space is constantly improving," Musk told SPACE.comearlier. "Only if that happens, will we become a true spacefaring civilizationwhere ordinary people have the opportunity to travel in space," Musk said. SpaceNews writer Brian Berger contributed to this report from Washington D.C.